Ben Macintyre’s For your Eyes Only: Ian Fleming + James Bond has been published in paperback in both the UK and the US today. 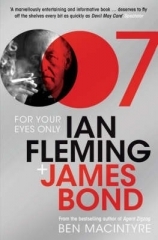 If you’re interested in this book, which was a companion to the Ian Fleming Centenary exhibition at the Imperial War Museum, check out my review. The exhibition was shut down on March 1st.